The public (and by this I mostly mean the planning profession) usually associates New Urbanism with a kooky and nostalgic interest in copying historical architectural styles, especially here in Europe. And this is no wonder, because Europe is home to a few intensely traditional designs such as Poundbury in England and Jakriborg in Sweden. And they’ve repeatedly hit the headlines over the years. Jakriborg. 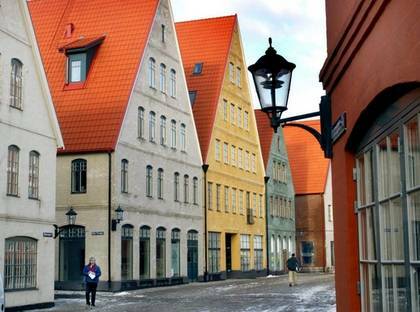 This medieval town is built near Lund in the late 1990’s. Photo courtesy of Minerva’s blog. But New Urbanism isn’t in fact as much about neo-traditional architecture as it is about traditional neighborhood development (TND). The goal of TND is to place special attention on the urban surroundings that we live in. Everyone with a heart for good urbanism prizes the idea of creating walkable mixed-use neighborhoods with easy access to public transportation. But typically we’ll just try to meet this with the same suburbia-embracing planning doctrines as we’ve built everything else with. The result? Denser sprawl. Sure, the neighborhood can sort of technically qualify as “urban” having a train station within walking distance, and a couple of supermarkets and an office building somewhere in the middle of it. As city dwellers we’ll think “it’s OK. Could be worse. You got to live somewhere, right?” But not in a million years would we start comparing it with the kind of urban places we spend a lot of time and money visiting and admiring around the world. TND advocates go for the extra mile and seek to shape public spaces, streetscapes and buildings with time-tested design practices. The goal is to create places truly worth caring about as much as to foster sustainability and promote public transit. Architecture is just one dimension in the big picture, but it just happens to be so that modern architecture reflects a very different perception of the city than the traditional kind and makes it therefore difficult to fit in the equation. Although New Urbanist communities are gaining ground around the globe, the Finnish planning profession is generally still very hostile towards traditional urban designs. It’s no surprise we’re still waiting for the first New Urbanist neighborhood to pop up. But it’s not entirely bad news. We do have one neighborhood that stands out with its neo-traditional architecture: Kartanonkoski. This project is quite intriguing because it visually really differs from our conventional style of urban development. The neighborhood is located in Vantaa and has been gradually built since 2000. 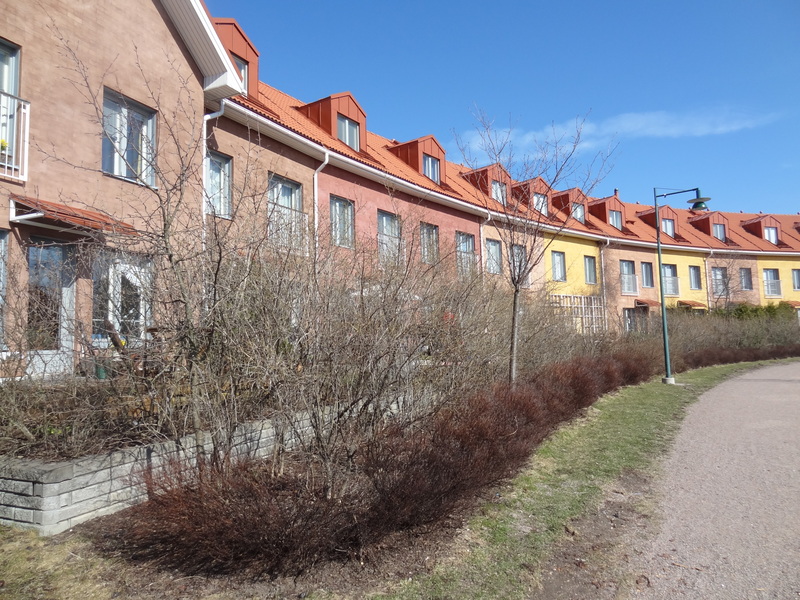 A nice row of townhouses in Kartanonkoski. Many times people associate Kartanonkoski with New Urbanism because of its architecture, but I’m afraid it’s far from it. The neighborhood is more like a typical apartment building suburb in disguise. Needless to say that the neighborhood can be considered as progress in the Finnish context, but my point is to emphasize that we are not to confuse it with any notions of good urbanism. I’ll do a quick comparison between the “traditional” design of Kartanonkoski and a real New Urbanist neighborhood by European standards to highlight my argument. 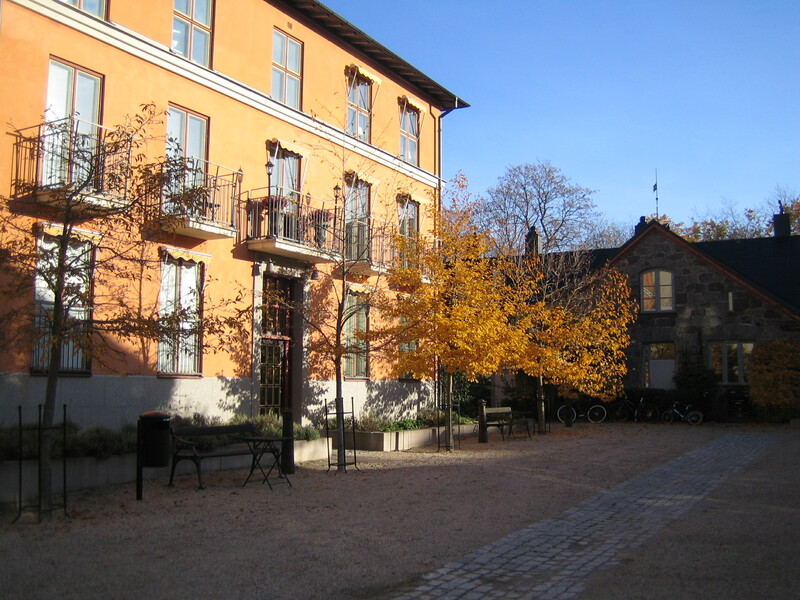 I spent a weekend in Stockholm last October with a group of friends and used the opportunity to visit Sankt Erikskvarteren, a 1990’s inner-city infill project. So I’ll use it as my TND example. I highly recommend you go see it too if you ever find yourself in Stockholm. On the surface level, both neighborhoods represent similar 1920s neo-classical architectural designs, but a closer look into three important concepts of urbanity reveals why Kartanonkoski is just another sprawl project – if certainly more positive than a conventional one. The first key difference between the two neighborhoods is in where they are built. Sankt Erikskvarteren is located in the inner-city borough of Kungsholmen and a direct extension of the existing urban fabric while Kartanonkoski is built in the middle of a field in the outer suburbs of Helsinki (Vantaa = suburban Helsinki), next to a strip of big-box stores. From Sankt Erikskvarteren you can basically reach anyplace in central Stockholm with your own two feet whereas in Kartanonkoski you can walk, well, around Kartanonkoski. There is little reason to walk anywhere from there, because there really isn’t any destination to walk to nor would you in any case find it convenient because the neighborhood is tucked in between two major highways and farmland. Your best choice is to hop in your car, because public transportation isn’t that good either. Sankt Eriksvarteren is located directly in the city. Kartanonkoski on the other hand is somewhat disconnected from the city. From a New Urbanist perspective Kartanonkoski is not sustainable or accessible. It promotes automobile-dependency, reduces farmland and is just simply far away from everything. This second point is closely connected to the first one. In a mixed-use neighborhood residential, entertainment, commercial, employment and recreational activities are all available in the immediate vicinity — preferably in walking distance. The inner-city location of our Swedish neighborhood already checks this box. But that’s not all. Despite being primarily a residential area and relatively small, Sankt Erikskvarteren also boasts a couple of cafés. Kartanonkoski on the other hand doesn’t even have a corner store even though it’s home to about 3 000 people. There are schools, daycares and a library but that’s it. For everything else you’ll need to wander off (read drive) to the big-box stores close-ish by. Oh yeah, there’s one large factory-like bakery next to the neighborhood, but I’m not sure if you can actually buy anything from there. In any case it doesn’t exactly match anyone’s idea of a nice neighborhood bakery or café. It of course means jobs, but we’re still light years away from being able to call Kartanonkoski a mixed-use neighborhood. Get your coffee here in Sankt Erikskvarteren. Follow the neon lights of the big-box Bauhaus for some local shopping. You might have to zoom in to see it in the background. Even if the buildings in both neighborhoods are architecturally somewhat similar, they are laid out in a very different way. Kartanonkoski’s layout reflects a car-centric approach, the lots and yards are overly large, and most buildings and streets have no real relationship. You run into parking lots everywhere and a huge chunk of the “green” is the no-man’s-land kind. While a few streets here and there are designed nicely having buildings connect to them, many times buildings have setbacks and streets and sidewalks are separated by a planting strip. The big picture is unmistakable: Kartanonkoski is just a polished-up version of the modernist neighborhood unit. Sankt Erikskvarteren on the other hand is so carefully integrated to the older urban fabric around it that many people wouldn’t even notice that it’s built only about 20 years ago. The neighborhood’s buildings are aligned neatly along its streets which creates clearly defined and intimate public space. There are also a couple of small parks, clearly designed as areas for public enjoyment. It’s the best example of a neo-traditional urban layout I’ve come across. You cannot mistake being anywhere but in a city. Kartanonkoski’s layout. Picture taken from Google Maps. Sankt Eriksvarteren from the air. Picture taken from Google Maps. It’s quite clear that Kartanonkoski is not built with the same kind of passion towards the urban environment as Sankt Erikskvarteren is. I don’t mean to say that the spaces between buildings in Kartanonkoski are neglected as such, because everything seems to be well taken care of. There are nice and safe pedestrian paths, a small park with a cute pond and a playground or two. But the way things are arranged in them just doesn’t support any kind of liveliness or social interaction that cities are about. Things seem to be just randomly thrown around without any clearly noticeable attempt of creating definable urban space. And since the neighborhood layout is kind of haphazard, it is difficult to make sense of it. The vast open farmland or the big-box stores as neighboring landscapes don’t exactly help in introducing an urban atmosphere of any kind either. I think it’s marvelous that the developers of Kartanonkoski have been brave enough to do something different. And above all, we now have a concrete example of what neo-traditional architecture could mean for Finland. Many people, especially families, find the neighborhood appealing, which we can see in skyrocketed apartment prices. Take note, city officials. The next initiative I would like to see is adding traditional neighborhood design in the mix. Who’s got the guts? It would be interesting to explore the reasons for leapfrog development further, obviously developers would like to build in town as it would fetch higher prices, but since zoning-parking-planning regulations make it difficult to acquire and build on land close to city with get leapfrog development. How does stockholm deal with this and get infil? What percentage of stockhold new housing stock is infil vs leapfrog? There undoubtedly are numerous reasons for leapfrog development from a planning practice point of view. Also a lack of a hierarchical municipality structure around our major cities facilitate leapfrog development by creating an unsustainable competition for taxpayers between municipalities. But regardless of all this, by far the most important reason for leapfrog development is that we choose to do so. I think the nearby main shopping street Valimotie could be developed in to a urban area, it certainly is anything but that, but there is room and perhaps even commercial interest for development. Thanks for your thoughts! I completely agree with the reasons for leapfrog development. I actually plan to look into all of those sprawl practices in the future myself too. And about Valimote, kind of hard to see that happening. But anything done over there would be for the better as it’s difficult to make it any worse. tpyyluoma tells the truth. I met a doctor from Aalto Uni, member of the jury of the Kartanonkoski competition, who told me that the detail planners had to use some extra creativity to cope with the rules and regulations and still make the “Finland´s best housing area” they intended. So, Kartanonkoski is the best one can get with the Finnish regulations and guidelines. Joel: do you remember who the doctor in question was? I would like to get a list of regulations that are in the way of building something as good or better than Kartanonkosk – so that we can get them abolished. I’ve always thought of Kartanonkoski as a sort of “town simulator”, it has the cute appearance of a small town, but it lacks nearly all the basic functions of a real one. Nice blog! Loves this panoramic picture. Yes, Kartanonkoski simulates towns the best in my opinion. I’ve given Kartanonkoski the name “the stage town” as it looks like it’s from a movie set. Even now when there are people living in most houses, it still looks empty and barren, like it was just a set up. However I agree it was a wise step architecturewise: having european-style townhouses makes it way more homely and inviting than your traditional Helsinki suburb. So at least the cute houses make me smile the one time a year I pass by it in on of the few a busses going through. Ps. There is actually one Alepa at Kartanonkoski but it kinda loses its point being tucked away next to the big box-stores near Valimotie. Thanks for your input! I totally agree, there’s something in the air there that just doesn’t seem right. That kind of architecture in the middle of nowhere is somehow a paradox. One detail is especially curious: they have street-side parking in places but every single spot is reserved for someone. Staged urban parking.